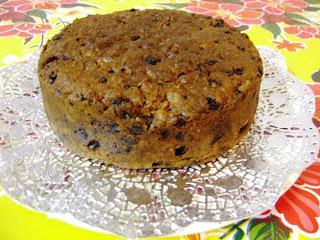 I've made my Xmas cake. Yes, last night I made it and we all had a stir and a wish. My wish from last year came true - a healthy baby girl - so I have high hopes for this year's wish! I fancied a change, so I trawled through all my books and the net for a new vegan Xmas cake recipe but, in the end, I decided to use the same one I've used the last few years. The cake is so utterly delicious, I just knew it'd be better than all the recipes I studied over the last week. Go here for the recipe I posted last year, which comes courtesy of the fabulous Rose Elliott - with some adaptation. Calling this an Xmas cake in this house is laughable really, because we tend to eat it from the start of November until it runs out. It calls to us from the tin...and anyway, Christmas is so goody-packed, you don't really need a cake, do you??!! I plan to keep it intact for a while so no doubt it'll still be here on the 7th. It lasted til the end of November last year!